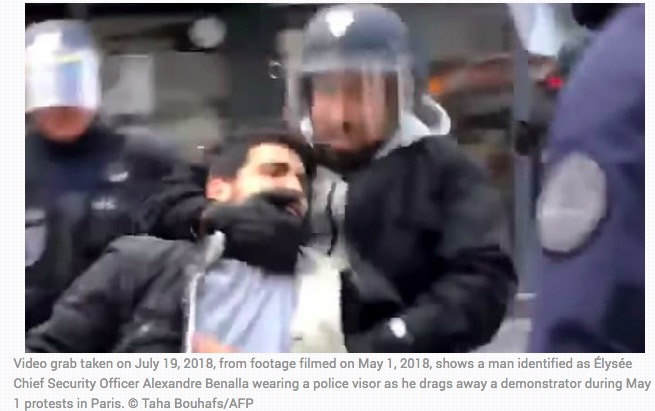 In what French media describes as "the most damaging crisis yet for" French President Macron, a political scandal has revealed major gaps in the country’s enforcement of video surveillance regulations. These gaps could expose integrators and end users to government fines and other sanctions. ** ********** ***** *********** "*** **** ******** ****** *** ***" ****** ********* ******, a ********* ********** ******** ***** **** ** *** *******’* *********** ** ***** surveillance ***********. ***** **** ***** ****** *********** *** *** ***** to ********** ***** *** ***** *********. ****** ******* ** ******* ******* **** **** ********-********** ***** **** make ********* *********** ** ***********. **** ******** ******* ****** **** ***** *** ************. *** ****, *** **’* *** ******* ***, **** ******* * slew ** **** ********* ******** ** ***** ************. *** * ****** ********* ******* ******* ***** ******** *** *** stricter ** ***** **** ** *******. ********* ******** ****** ******* ***** **** ***** ******** ** *** ******** ** *********** ********* *** *********, ********* *******, ********* **** ******-***** ********* *** beat ********** ****** * ******* ** ***** ** ***. ****************** *** ************ ******* ** ************ *******, ********* ***** ************ footage, ******* *** ******** ********** ** * ** * ***** of **** *** ** ** ***,*** ***** ** *****. ***** *** **** ********* *********** ******* *** ******** ****** *******,***** ****** ***, **** ****** ********** ******* *** *** ******* ******* ****** space ** ** **** *** * *****, ***** ***** ** must ** ********* ****** ** ****** ******** ************* ** ****** place. *******, ******* ******** *** ******* **** * ****** ***** the ******** **** ***** **** ** ******** ************* ******** ** that ****. “****** **********” *** ***** ************ *** ** ** ***** ****** cities *** *********** ***** *** ***** ** ****** *** **** no ******** ******. *** *********** **** *** ****** ********* ** ******’* **** ********** agency, *******. *******, ** ** *********** ** ** **** ********* *** other ******* ******* *** *** * ********** ***** ****** ** 17 ******* *****. *** ******** ******** *** ** ** *********-******** “******** ***** ************ Commission” ** **** *** ** *** **** ********** ******** *****. Its ***************** ********-*********. ****** ***** ************ *** ********** ********, * *********** ** *** ********** ** *********, **** **** that *** ****** **********’* *********** ** ***** ************ *********** ** lacking. ******** ********* **** *** ******** ************ ******** ** *********** ** install ***** ************ ******* *** **** **** “************” ***** **** 2-3% *** **** ********. ***********, **** ** **** *** ******* to **-**** ****** ** *** ********. “[*** ***********’] **** **** ** ** ****** ************, ***** *** very *** **********,” ******** ****. ******** **** ********** ** ** **** ******’* **** ********** *********, the ****, ***** *** ******* *********** ******. *** **** ********* are ****** **** *** **** **** **** ***, ** ** only ********** ****** *** **** ********* *** ******* ***** **** **** of ***** *******. *** **** ****** *************** ** **** ** “********” ** **** ********** *** ***** compliance ** ***** ************ *********. ******** ************* ******** ** ******’* ******** *******; ***** ***, *** **** *** either **** ********* *************** ** **** *** ***** ******* ******** sanctions. “*** **** **** ** ***** ********** ** ********** *** ******* and *** ********* * ******* ** *** ********** ** ********* video ************ *******”, * ************ **** ** *****. *** **** ***** **** ** *** ******* *** ***** ***********’ video ************ ****** ***** ** *** ******* ********, *** ******* by ******* “*********” ******* ** ************** *** **** ** *** ************* *** dissemination ** *** ******* ******** ** ******* ** ****. *** **** ** ************* *********** ** ***** ************ *********** ** France ***** *** **** ** ** *********** *** *** *****, not ***********, ** **** **** ******* *** *********. ** ********* by ********* *******, **** *********** ******* **** ***** ************ ***** place. **** ** ********** ********* *** ** *** ****. *** ***, which **** ****** ** *** **,******* **** ******* ********* – ** ** *% ** ********* ******** ** 20 ******* *****. ** ***** ** ****’***** *****, **** ** *** ***’* *********** ***** ******** ** ***** surveillance – *** *******, * *** ** **** ******* ********** use **** ****** *********** *** ****** *********** *** ********* ***********, customers, ** *** ***** ** **** ** * ****. *** **** ** ******* ******* ** ******** **** ***** ** any ********* *** **** ** ** ****. ** **** **** it *** ******* ** ****** **** ********* ***** ****** ** a ****-**-**** ***** *** *** **** ** ******, *** ******* in *** **** ** ******** ******* ***** ******** *,*** ******** ********* ************ *************** * ********* **** ** ******** **** * ****** *** installed ** *********** ******* ***** *********. ** ******** ** ***** ************ *********** *** ** *** **** and ************ ************* ***** ********* **********, *********** ****** ** ******* to ****** **** ****, **** ** **** **** **** ******-******** until ***. ** ** **** **** ***** ************ ** *** *** ******* target ** ****, ***** *** ******* ****** ** ******** ** large **** ********* **** ****** *** ********. *******, ** ****** ** * *******, ***** ** ** ***** back *** ********* *** ** ******. ************, *** **** ** **** ******** ********* ***** ************ – for *******,******* *** **** ********* *** ** ********** ********** *** ******* ********* *** ** the ****. ******** *********** ****** ** ***** ** *** ***** ************ *** make *********** ** *********. "******* ********** *** ****** from **** *********** *** still****** ******* ******* **** film ****** ***** **** streets(**** **** ******* ** outdoor ****** *******.)" **** ** **** ** crazy. *** ***** ***** mindset **** ********* ******** such ** **** ** terrifying.